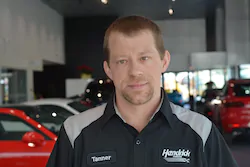 David has been part of the Hendrick Automotive Group since March of 1990. 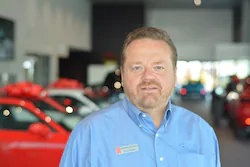 He was appointed General Manager at Hendrick Porsche in March 2009. He enjoys the opportunity to sell and service the finest sports car manufacturer in the world. When not at work, family and occasional travel are the focus. 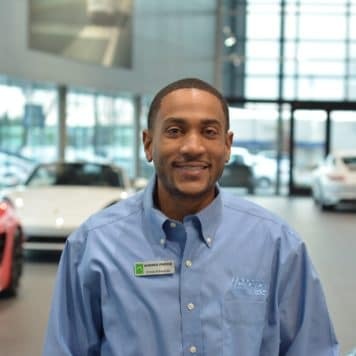 Albie has been with the Hendrick organization since 2007 and has been with Hendrick Porsche since 2009. Besides being a Certified Porsche Brand Ambassador he has great knowledge of current and past Porsche models for the road and for the track. He enjoys all forms of Motorsports from GT to Endurance and even open wheel racing. Dom has been in the car business for over 19 years, and with Hendrick Automotive group for 10. A Porsche enthusiast, Dom enjoys the style and performance that Porsche has to offer, and can’t imagine driving anything else. He has a wife and 2 children with whom he loves spending time with swimming, and vacationing. His favorite vacation spots are the Caribbean and Disney World. Born and raised in Thailand for the earlier years of my childhood and then traveled around as a military family. Learned English in Japan, then South Dakota, and eventually settling in with a final move to Fayetteville, N.C. Married my lovely bride whom I met at 15 years of age and settled here in Charlotte nicely with 2 beautiful daughters. Joined Hendrick Acura in September 2000 right after school at East Carolina University with a degree in Finance. Worked at Acura the first time for 4 ½ years as a President’s Club Sales Rep. Left for 14 years to become a Sales/ Branch manager of an Insurance Company and eventually my own Financial Service firm. 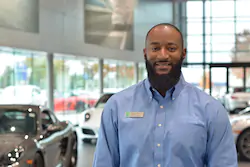 Now I’ve found my way back home here at Hendrick Porsche where I’ve brought my experience to help contribute and be a part of a winning Automotive group. 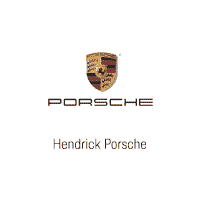 Todd has been in the car business for over 27 years and with Hendrick Porsche for 19. 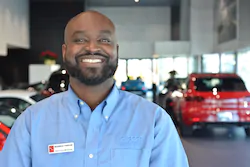 He has had experience in all aspects of a dealership including sales and service. He is currently a member of Porsche’s round-table meeting and has served on Porsche’s after-sales group in the past. Outside of work he enjoys going to the beach and spending time with his wife and kids. 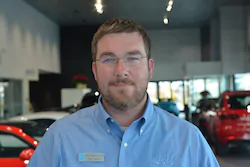 Michael has been with the Hendrick Automotive Group since June of 2002. Michael joined Hendrick Porsche in November of 2014. Michael enjoys spending time with his wife and 3 kids while away from work. 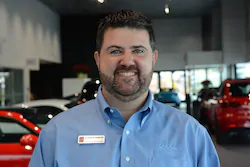 Steve has been with Hendrick Porsche since 2007 and is a Porsche Brand Ambassador. 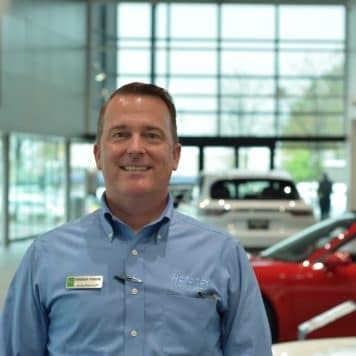 Steve entered the automotive retail business in 1994 while living in Michigan and made the move to beautiful Charlotte in 2007. Steve has three wonderful children, Samantha, Nicholas and Eric. He enjoys traveling with his family and the car culture. 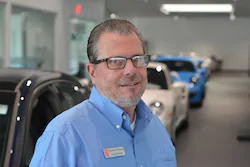 Greg has been with Hendrick Porsche since 1996 and is a sales and purchasing specialist with a passion for Porsches. He has been in the high-line car business for more than 25 years. When not enjoying being around Porsches, he likes spending time with family, racing and car shows. Drew is a native of Saluda, SC. He has been in the automobile profession since 2006. In 2016, he joined the Hendrick Porsche Family. Drew is an avid musician, sports enthusiast, and loves to travel. His favorite city to travel to is Miami, FL. It is both a fulfilling and enjoyable learning about these awesome machines, and serving the clients that love them as much as I do. Herman has been in automotive sales for over 15 years, most of that spent with the Hendrick family. He enjoys F1 racing, movies, and old Japanese anime. Herman’s favorite car is the 911 GT3 RS. Elliott has been with the Hendrick family over a year. He enjoys racing, video games, and the Marvel Cinematic Universe. His favorite car is the Cayman GT4. 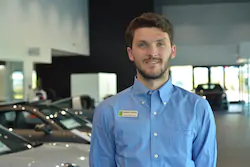 My name is Ryan Turner and I have been with Hendrick Porsche since 2009 as Sales support and Inventory. I enjoy taking photos of the most desirable cars on the planet, please follow our Facebook page and Instagram, @hendrickporsche to see some of my photos. I am married with 2 children. My favorite car is the 911 GT3. Worked for J.Crew as a manager for a year and a half before coming to Hendrick Porsche in April, 2018. I enjoy playing golf on the weekends and hanging with friends and family. My favorite car is the Macan GTS. 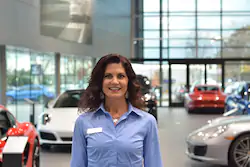 Amy has been with the Hendrick group for over 20 years, and with Hendrick Porsche since 2008. From her home office in VA, she handles all internet requests, schedules sales appointments, and follows up with all sales and service customers ensuring 100% customer satisfaction. Amy and her husband Chuck have two children, Chase and Ashley. 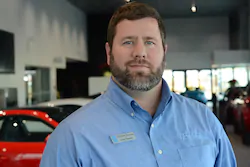 Shane has been with Hendrick Porsche since July of 2014. He is a Certified Brand Ambassador and Service Advisor for Porsche. He also worked at Hendrick BMW previously. Shane enjoys spending time with his wife and 3 children when not at work. Hobbies include golfing and going to the beach. His favorite car is the Porsche GT3. 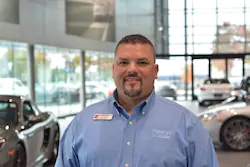 Tito has been with Hendrick Porsche since April of 2017. Previously worked with Roush Performance. He has been in the automotive and racing industry since 1994 on both the mechanic side and the administrative and marketing side. His favorite car is his 2017 Roush RS3 Mustang. 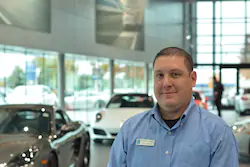 Rupen has been with the Porsche family since October of 2017. Previously with Hendrick Lexus for 2 years. He is currently working on his Brand Ambassador training. 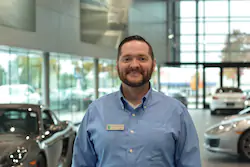 Rupen’s favorite car is his own Lexus IS-F.
Tanner Andren is a Gold Meister (Master) Technician that has been with the Porsche brand since 2002. He is from Montana, but moved here from Colorado in 2005 to join the Hendrick Porsche team. He is a three time participant in the Randy Dorton Hendrick Engine Builder Showdown and was a top ten Technician in the nation at the Porsche Technician Service Cup at Daytona Rennsport Reunion. In his spare time Tanner enjoys mountain biking, fly fishing, and traveling with his wife Katy. 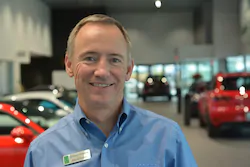 Jim brings two decades of Porsche expertise back to Hendrick Porsche. 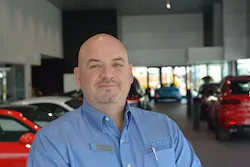 From his beginnings as a tech with Beck Porsche (Charlotte, NC 1985-1989) then to Hendrick Porsche (Charlotte, NC 1989-2001) as a Master Tech in 2001, Jim mastered numerous service campaigns and saw firsthand the introduction of over 25 new models and variations. Jim became foreman and the first Master Tech for both North and South Carolina. After 30 years with Porsches, Jim’s involvement with professional motorsports should come as no surprise. 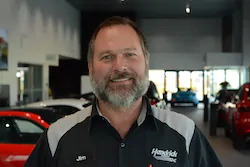 Since 2004, Jim has served as lead technician and crew chief for Michael Baughman Racing, Turbo Performance Center (TPC), and Autometrics in Grand- Am’s Rolex Series. As chief for TPC in 2006, Jim was instrumental in the class winning Daytona 24 effort. Cameron was a heavy equipment operator and mechanic in the United States Army. 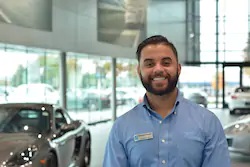 He attended Universal Technical Institute in Norwood, MA where he studied Automotive Servicing and Repair and was accepted into the Porsche Technology Apprentice Program after graduating. Originally from NH, he moved Charlotte to join the Hendrick Automotive Team in 2014. Cameron enjoys competitive shooting and hiking in his spare time. 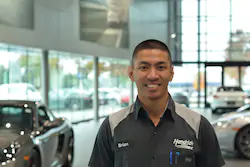 Brian Capili attended Universal Technical Institute in Los Angeles, CA where he studied Automotive Servicing/Repair and was accepted into the Porsche Technology Apprentice Program after graduating. 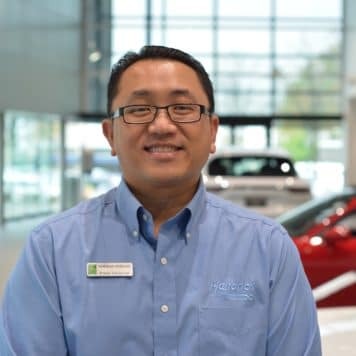 Originally from Guam, he moved to Charlotte to join the Hendrick Automotive Team in 2015. Brian enjoys spending quality time with his family, and lifting heavy metal at the HAG gym. His hobbies are shooting videos and taking photos with his canon rebel T5, and also brewing a great cup of coffee. 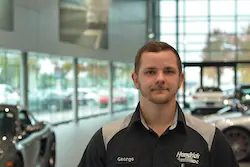 Conor Burgess is a technician who has been with Porsche since 2015. Originally from Northern Virginia, Conor moved to North Carolina in 2013 and attended NASCAR Technical Institute. On the weekends he enjoys playing with his dog and fly fishing. 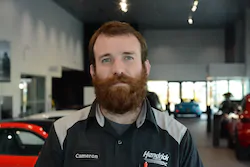 Matt has worked at Hendrick Porsche since September of 2017. Previously he was at Mclaren and Maserati of Denver. Matt is an avid duck hunter and enjoys fishing and hiking. Matt is married with a Newfoundland named Leo. His favorite car is the Porsche 959. 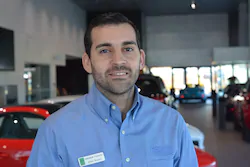 George has been with the Hendrick Porsche Family since October of 2017, and was previously with Porsche of Greensboro. He is Bronze Certified and working on his Silver Cert now. George attended NTI in Mooresville, NC focusing in air cooled Porsches. Then accepted into PTAP (Porsche Technical Apprenticeship Program) graduating top of his class. Some of Georges favorite cars are Ferrari F40, 964 RSR, and GT Clubsport. Thomas grew up In Massachusetts where he attended Universal Technical Institute for Automotive Technology. After graduating UTI he was accepted into the Porsche Technician Apprenticeship Program in Atlanta, Ga. 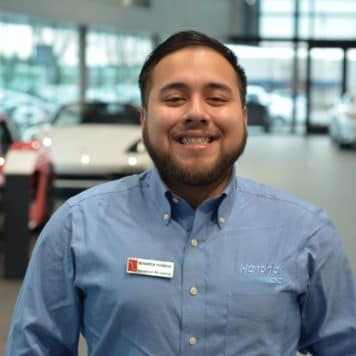 He has been with Porsche since February of 2012 and is a Gold Level Technician. In his spare time he enjoys mountain biking, camping/hiking, shooting, and is working towards getting his Pilot’s License. 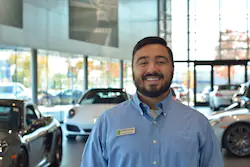 Zach Costner has been with the Porsche team since March of 2018. 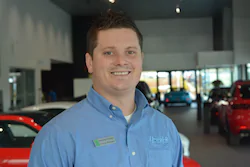 Born and raised in Rock Hill SC, Zach attended Lincoln Technical college in Nashville TN where he graduated at the top of his class for Automotive Technology with High Performance. 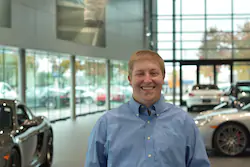 Zach enjoys spending time with his family, riding four wheelers, and working on classic vehicles. 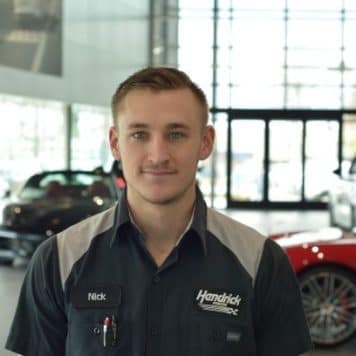 Nick has been with the Hendrick Porsche team since February 2019. Born and raised in Milwaukee, WI. Nick attended UTI in Avondale, AZ after transitioning out of the Marines in 2016. Nick is married and a father of two (Averiella and Tatem). He enjoys spending time with his family and friends. 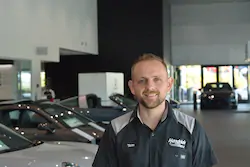 Jonny started with Hendrick Mini in 2015 followed by BMW and Land Rover. He came to Porsche in May of 2018. His favorite car is the 911 Turbo Exclusive Series. 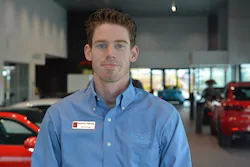 Chris has been with the Porsche family since March of 2015. He is currently studying athletic training at the University of North Carolina at Charlotte. Chris’ favorite car is the 911 Targa GTS. 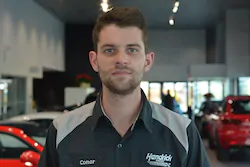 Evan has worked with the Hendrick Auto Group as a detailer since the summer of 2017 and came on with Hendrick Porsche in 2018. His favorite car is the 911 GT3! 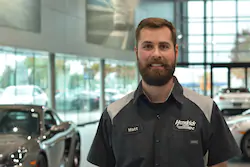 Mike has been with Hendrick Porsche since June of 2016, after living in Chicago his entire life. Since 1994, he has had a passion for the automotive dealership parts department operations. Of the twenty-four years, seventeen of them have been with the Porsche brand. During his time off of work he enjoys spending time with his wife, his son and two daughters. He also enjoys getting to spend time in the yard, perfecting his landscaping. When time permits he and his family like to spend time at the beach. 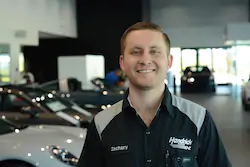 Colton has been with Hendrick Porsche for four years in the parts department and he love every minute of it. Some of his hobbies are hanging out with Friends and Family, riding his Harley, and touring/tasting local breweries. 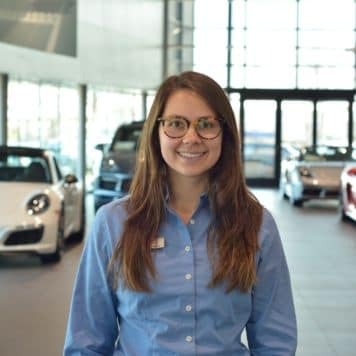 Anna has been a part of the Hendrick Auto Group since April 2015. Anna enjoys relaxing, food and beer in her free time. Her favorite vehicle is the 2019 Cayenne Turbo! 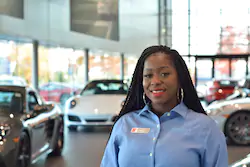 Whitney has been with Hendrick Porsche since August 2016 and serves as one of our Customer Experience Manager/Event Specialist. In her free time she enjoys spending time with her son, traveling, and working out. 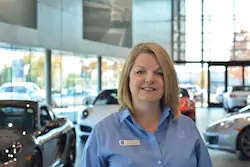 Dawn has been with Hendrick Porsche since August, 2015 and serves as one of our Customer Experience managers. Dawn has years of experience in customer service and as a quality coach. She is passionate about creating a positive and memorable experience for Porsche Clients. Dawn enjoys cooking, hiking and spending time with her husband Steve. They have resided in Charlotte for 28 years along with their two adult children, Andrew & Elisabeth.